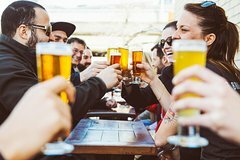 On this 3-hour small-group tour, you'll sample a grand total of eight craft beer samplers, one Whiskey and three delicious snacks. This is, without a doubt, the most generous beer tour available in town! Including an exclusive access to the brewing facilities, ask your expert guide about the city's rich beer history. This personalized excursion through the Old Port is sure to leave you with great impressions and unforgettable memories. You will meet your expert guide directly at the hospitable ''BreWskey.'' You will feel right at home and quench your thirst with two specialty beers plus a fabulous Whiskey sampler. The beacon jerky on offer pairs itself just perfectly. You will then move on to ''3 Brasseurs St-Paul'' to discover their beautiful facilities. While there, you will learn about the brewing process and obtain three new, delicious, beer samplers along with a fresh pretzel. Your beer adventure will conclude at ‘’Bistro Brasserie les Soeurs Grises.'' There, you will receive your last three craft beer samplers, paired with local cheeses. As you walk through the Old Port, your guide will supply you with interesting facts about Montreal’s rich beer history. As you walk through the Old Port, your guide will supply you with interesting facts about Montreal’s rich beer history. This 3-hour tailored tour includes a grand total of eight craft beer samplers, one Whiskey and three delicious snacks. This is, without a doubt, the most generous beer tour available in town! The fun and memories are, of course, free of charge!